Mid Island Fishing Charters in Campbell River specializes in saltwater fishing charters in and around Campbell River on north central Vancouver Island. Vancouver Island is located off the west coast of beautiful British Columbia, Canada. Mid Island Fishing Charters is dedicated to providing anglers with exceptional BC salmon fishing trips and great Canadian outdoor experiences. Our unique Campbell River fishing region is a fisherman's paradise and has been known for many years as the “Salmon Fishing Capital of the World”. It is home to 5 species of wild Pacific Salmon (Chinook, Coho, Sockeye, Pink and Chum). And if that isn’t enough the whole area is surrounded by breathtaking coastal BC scenery and an abundance of wildlife. 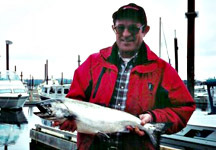 Harry MacDonald, owner, operator and experienced Campbell River fishing guide, has spent over 30 years fishing in local waters. He is one of the first “Certified Tidal Angling Guides” in BC. Harry is a skilled BC fishing guide and charismatic host. Many of his fishing charter guests become friends, fishing with him year after year. Harry's 23' Sunbird walk-around fishing cruiser, the “Dirty Harry”, is fully licensed & insured, Transport Canada inspected & approved and equipped with the very best of fishing tackle and state-of-the-art power and electronics. 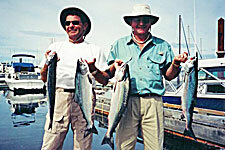 Let Harry and the “Dirty Harry” make your Vancouver Island fishing day! 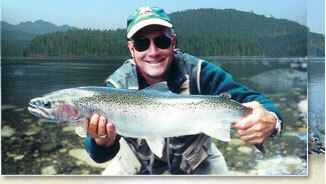 Customize your Campbell River fishing trip to suit your needs. We can arrange salmon fishing charter packages suitable for singles, couples, families or corporate groups. Larger groups requiring more fishing guides are no problem for Mid Island Fishing. The Vancouver Island fishing guides we work with are professional, very competent, have comparable boats and, perhaps most importantly, have earned our personal stamp of approval! You have come to the right place if you are interested in fabulous BC fishing trips along with spectacular wildlife viewing opportunities and breathtaking scenery in the Campbell River, Vancouver Island area. Contact us to book your British Columbia salmon fishing charter. We look forward to hearing from you soon! Click here to purchase your fishing license on-line prior to arriving in Campbell River. No restrictions on age or level of fishing experience. Plan on booking your Campbell River fishing charter early, as the summer months are typically very busy. We are happy to supply references and answer any questions you may have. For larger groups, the BC fishing guides we work with are very competent and have our personal stamp of approval.